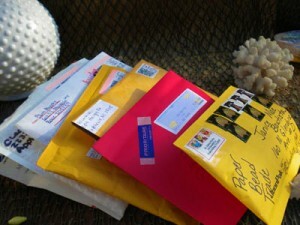 I was supposed to do a tutorial on crocheting with beads (the easy way), but I just had to interrupt today’s post (or tomorrow), I am too excited when I received these packages today from you guys! Let me share with you the paper beads I got in the mail today, all eight of them! These are from Aileen, I especially love the mauve color bead, the confetti looking ones and the peachy colored ones. They are all beautiful. These ones are from Patty, she made them on her trip to Aruba, and they are made from travel brochures and she actually rolled these beads on the sand from the beach! How cool is that? You will be getting beads that has sand from the beaches in Aruba 🙂 You can check out Patty’s other hobby at punchneedlechix. 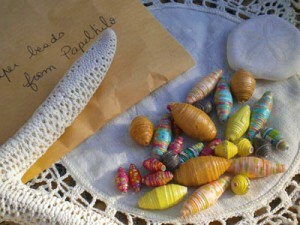 These babies came all the way from France, Claire shares tutorials and all sorts of craft in her blog Papelhilo. I just love the bigger beads in caramel color which would be really good as focal beads. 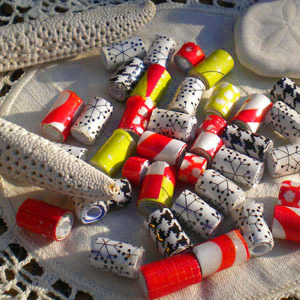 I have received these barrel shaped paper beads from Kari, the red ones is so rich in color and the black and white patterned beads almost look like the zentangles that I did. They will look pretty with spacers in between them. Gisela’s beads, are lacquered to a glass like finish! 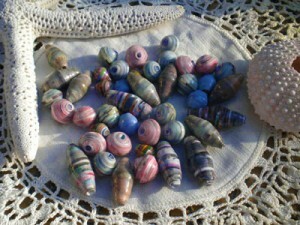 Do you want to share with us your technique 😉 They are beautiful, love the pastel colors and the big tube ones would make a nice focal bead as well. She sent us enough, I will make sure everybody get some of her beads. 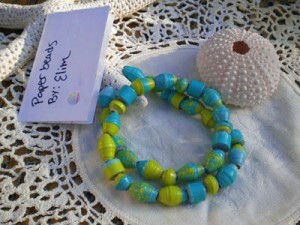 Next, is Elim’s and sister Liz’s paper beads. 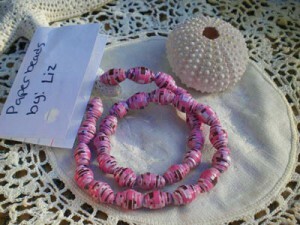 You can see more of Elim’s paper bead creations here. She sent it to me strung, olive shaped ones, spacers and barrel shaped, Maybe Elim can tell us the type of paper she used, they are so pretty. Last but not least, is from Christine, what a mixture of lively colors; hot pink, baby pink, olives, maroon, aqua blue and I especially like the black bead. 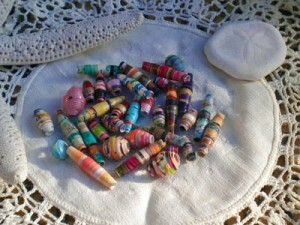 So, there it is folks, some really nice paper beads each one hand rolled by you! Hopefully I will get the rest of the beads this week, irregardless I will be sending out your kits on July 15th. I will be sharing with you my sister’s beads as well, mine and Kayla’s. What site did you get this information from? And what type of sand paper? Janice, actually, I would love to join, but I don’t have the time. 🙁 Maybe my friend would like to…. You are the first one on that list. Karina is thinking about it, we’ll see….. I received my beads while out of town! What fun to come home to this challenge. Thinking cap on! I didn’t sign up for the paper bead trade, but I’m curious-what are you putting in the kits? 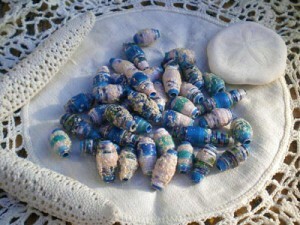 The participants in the Paper Bead Trade (I had a post about it), will get in their kits: paper beads from other participants, there’s about 20, filler beads and findings that they can use to make bracelets or necklace. You will end up with a unique piece of jewelry. Im sooo sorry its taken me awhile but i will be sending my beads to you tomorrow. So glad, I will get them to the post office in the morning. Hi everyone, I was hoping to get in on this one, but got called away to take care of my Mother (heart attack and stroke victim) and totally forgot to get them in the mail. I am sending them tomorrow anyway and hope it is not to late, if it is, then they will be the first collected for the next swap. Mine are from paper that my Daughter and I made then cut and twisted into beads. I put in 3 different colors. I love all of the helpful hints. 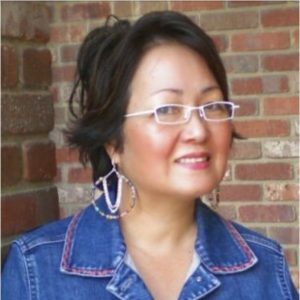 Gisela: I stick mine on a bamboo skewer, then hand dip them, and stick the end down into a container filled with rice or beans. That way I just keep re-using the same base to stick them in. I tried the styrofoam and was only able to use it a few times till I had to poke more holes and they got bigger and bigger… the rice works great and I have had to add some due to spilling some, but other than that it has been wonderful. Karen, to make the chunky beads don’t cut the wide end of the paper so wide and make sure you get a good sharp point at the end. If you do this with cardstock or heavy paper then you will get a good fat bead. Can anyone help me. I want to glaze my beads to a smooth finish. Right now the ridges are defined and for some beads that is fine, but for others I would like them to look and feel more smooth. Thanks everyone! Having recently fallen into the ‘must make beads every day’ pool, I find myself drooling over all of these wonderful, beautiful beads! I’m envious of the nice chunky round beads, as I can only seem to get mine to end up looking like tubes with a slight bump in the middle. Looking forward to chatting with all of you, keep up the lovely work! I’m glad the beads got to you. I am excited to see them on your page. Everyone made really beautiful beads. I’m starting to experiment with pizza boxes and frozen lunch boxes. Maybe for the next swap I will send those in! They are all ao beautiful. I don’t think I could pick a favorite. This is wonderful. I am so looking forward to working with some of them. The glaze on mine is pretty simple. I got it from a tutorial online. I save the styrofoam sheets from mail orders. then I put each bead on a toothpick and stick it in the styrofoam. I then brush a diluted glue solution (one part glue and three parts water) on and let dry. I do this about 10-12 times, each time rotating the bead in case of sticking. I sand the ends and apply two coats of acrylic (Future floor wax works fine) and there they are. I hope this was not more then everbody wanted to know. I am new to this and sometimes a little unsure. Wow! These all turned out great! wonderful how different they all are !! 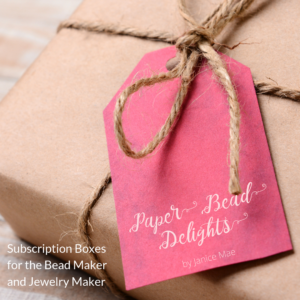 it will be so exciting to do something out of everyone’s beads ! 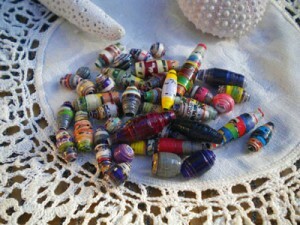 And the paper I used was from a scrap-booking kit my mother gave me to make colorful beads. Sometimes I just paint on paper then when I roll them up they come out swirly and lovely.